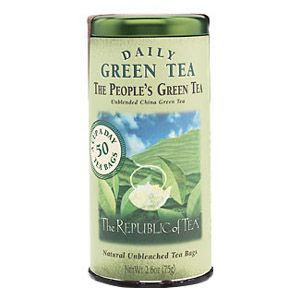 The other day, I had a cup of "The People's Green Tea" made by the The Republic of Tea (those nice cylindrical tins with the paper wrappers you can get at Whole Foods). The branding of the tea seems intentionally to invoke the People's Republic of China and Maoist simplicity. And I got to thinking -- communism and communist kitsch is irresistible to corporate marketers because communism is fundamentally aspirational and communal. Marketers know that people want not just a product but an experience, a brand that appeals to their aspirations in life. Furthermore, people want connection with others. And communism supplies a readily recognizable utopian ideal and communal emphasis. Which is kinda fascinating when you think about it -- that both communism and corporatism are appeal to the same fundamental human desires for transcendence and connection.